The holiday season is about to get into full gear here in the Islands and that means the most popular room in the home will become even more popular: the kitchen. The delectable aromas wafting from the kitchen are usually at its most tantalizing not just once over the next several months, but three times for many homes. Probably one of the reasons why weight gain happens most frequently over the next three months. Click on the cover image to be taken to Hawaii Home & Garden magazine issue #3 for viewing or download. To celebrate the occasion, Hawaii Home & Garden Network is holding it first contest: a gift card giveaway. Two, $50, Zippy's, gift cards. I'm sure they'll come in handy as gifts or to use on your own. 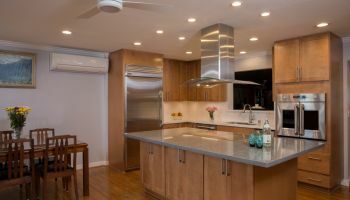 The answer to the contest question can be found in both the blog and the accompanying video in this issue's featured kitchen remodel by Homeowners Design Center. Kitchen remodel cover feature by Homeowners Design Center. Click on the photo to be taken to the blog and video with the answer to the contest question. For all the rooms in a home, a kitchen remodel can become the most expensive, especially if you like bling, and who doesn't like bling in a kitchen, especially if you can afford it? Bathroom remodels can get expensive as well, but fortunately, "nice and updated" on a budget works perfectly fine for this room. This issue features two projects that fit this description. 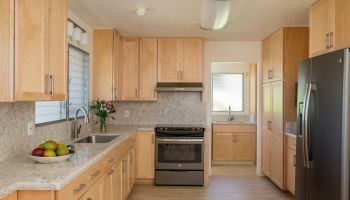 The folks at INSOLID helped a Mililani couple update their 20+ year-old bathroom without using demolition, saving them a lot of money. Click on the above photo for more information about home remodeler INSOLID. While Hawaii Kitchen & Bath helped an older couple get ready for their retirement years by giving their old bathroom a serious makeover. Click on the above photo for more information on home remodeler Hawaii Kitchen & Bath. By entering your name and email address to enter the gift card giveaway, you are signing up for an email subscription to our web-based magazine "Hawaii Home & Garden". You must enter your first and last name, email address, the correct answer to the contest question AND "Like" our FaceBook page to be eligible to win. The answer to the question can be found in both the blog and accompanying video about the kitchen remodel featured in this issue. Please enter your main email address as the winner will be notified through it on Nov. 30, 2015. The entry cutoff deadline is Nov. 20, 2015. The answer to the contest question will be posted on the magazine page of our site on Nov. 23, 2015. The contest is for Hawaii residents only because the winners must provide a valid Hawaii state address, as the gift cards will be sent by certified mail to the addresses provided by the winners. All personal information will be kept confidential and held in strictest confidence and will not be given to third parties for any reason. Hawaii Home & Garden clients, their employees and those working with HHGN are ineligible to enter. Only one entry per person allowed. Multiple entries will result in disqualification. Who is the first person to realize the significance of the new kitchen island? Link to the featured kitchen remodel blog and video. Link to the contest entry from. Good luck! Try your best at resisting the temptations of the kitchen more than usual. We know it can be tough, especially with all the other homes you'll be visiting this time of year. And we all want to wish you and your families a safe and wonderful holiday season!